Idli and dosa are easiest and healthiest tiffen items. 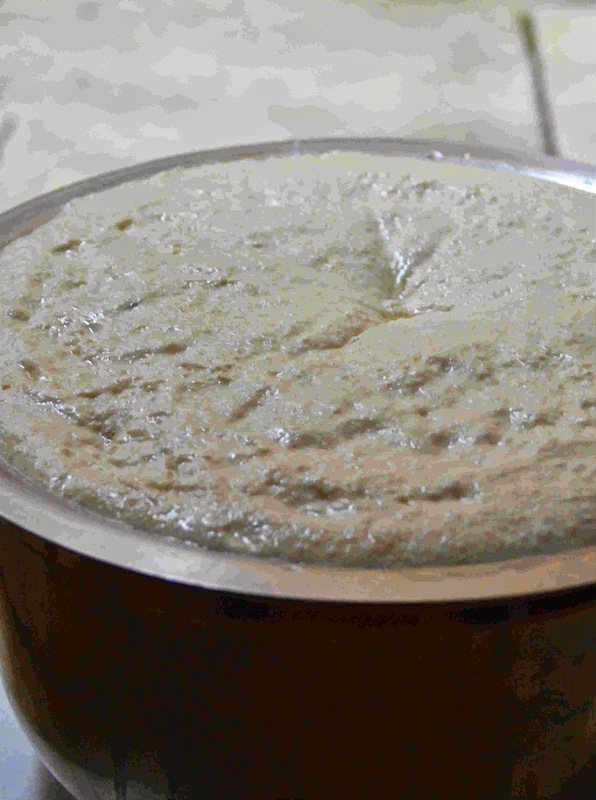 If you have the batter ready, after fermenting you can make idli the first day and with the same batter (by diluting) you can make dosa the next day. As we are steaming the batter, idlis are always healthier than dosa. Since idli batter is made with rice and dal, it provides carbohydrates and protein, which is very essential to our body. I hope my step by step pics will help you better. 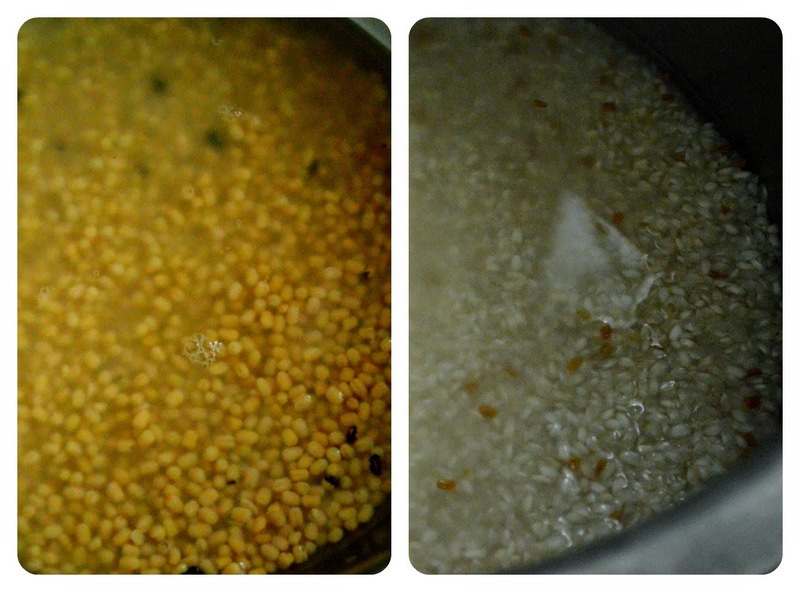 1) Soak urad dal separately and Idli Rice & fenugreek in water for about 3-4 hours. 1) First we need to grind urad dal separately. 2) Switch on the grinder and when it runs, add urad dal slowly. 3) Some prefer to add the urad dal completely and switch on the grinder. You can select the one that is comfortable to you. 4) Add just half a cup of water in beginning and let it run for ten mins. 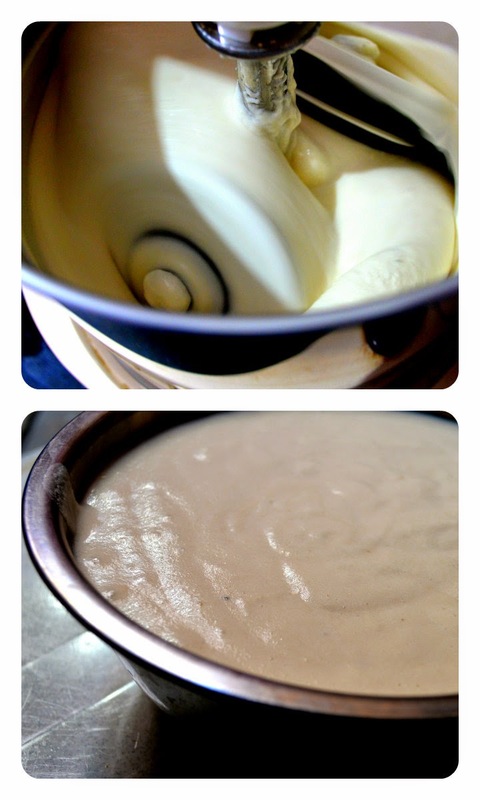 5) Then add another half a cup and let it run for another 10 mins. 6) By adding water slowly, urad dal batter will not get more diluted. 7) Make sure that enough water is added otherwise the grinder will slow down. 8) Once urad dal is grinded completely into a thick paste remove it from grinder and keep aside. Paste should be smooth and fluffy. 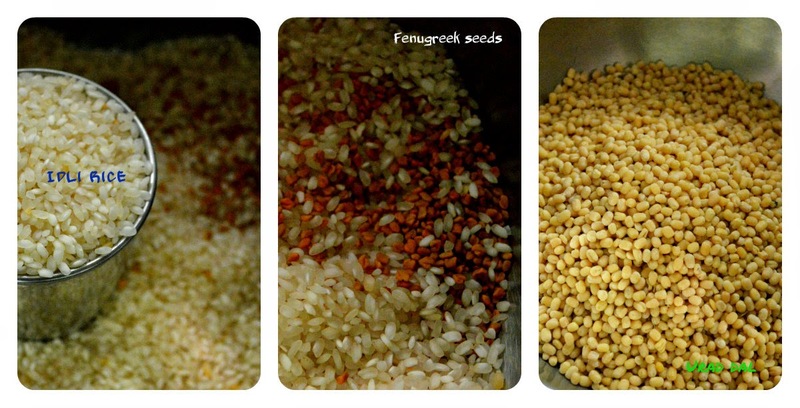 1) Now add rice and fenugreek to grinder and start grinding by adding water. 2) Afer 10 mins add few more water. 3) Once the rice comes to fine rava consistency switch off the grinder. 1) Remove rice batter from grinder and mix urad dal batter to it. 2) Mix enough water and salt (approx. 1 tbsp.) and stir well. Keep it aside to ferment. The idly batter would have raised nicely. 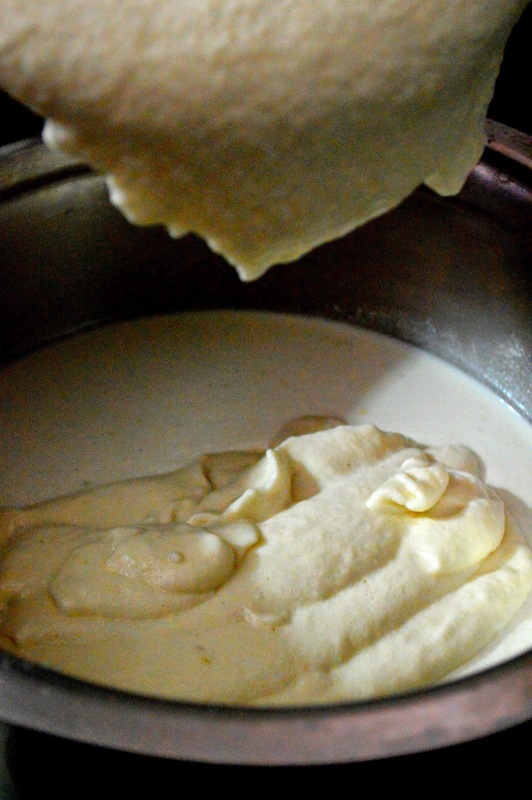 The same batter can be used for dosa as well, but you need to dilute the consistency. This will help you to take a ladle full and pour on tava and make a nice thin round dosa. 1) I generally add more of fenugreek seeds (around 2 tbsp) as it is good for health, you will not find any difference in taste or texture. 2) Before using the grinder, I always prefer to clean it nicely by pouring a cup of water and let it run for few secs. and then discard the water. Then again I will wash the inner part of grinder in tap water. 3) While grinding rice or urad dal, make sure you push particles sticking to upper part of grinder to the inner part occasionally using a spoon. If you don't push it, you will get nice paste inside but the outer ones will not be grounded and will stay as big particles. 4) Rice gets grounded fast, as we are grinding in rava consistency. So never step out for a longer period, you need to check every 10 mins. 5) You can use some urad dal batter to prepare urad dal vadai. But make sure you soak extra urad dal as per your need. If you are preparing the batter for first time better to avoid this step. 6) Fermentation time changes according to climate and geography. If you are in warm place, it will come up quickly compared to a cold place. Generally it takes overnight (around 12 hours). 7) I always prepare idli batter to be grind only with grinder than a mixer. You will surely get soft spongy idlies if you grind with grinder. 8) Adding 1 laddle of cooked rice or soaked beaten rice (poha) while grinding rice or urad dal will also give you soft idlies. Also some prefer to add a laddle of soaked raw rice too. You adopt a method which gives you soft idlies and crispy dosas. 9) Either rock salt (Kal uppu) or table salt can be added. You can add it while grinding rice or you can add in final stage. 10) Quality of rice and urad dal is important. Good Quality of urad dal will give you nice fluffy batter after grinding. I am sure you might be wondering what to plan while preparing idli batter. 1) Plan for Pesarattu or Adai the same day and soak the necessary ingredients when you soak for idli batter. 2) Plan for Urad dal vadai. Soak green gram or adai ingredients separately when you soak for idli. When you complete grinding rice, after taking rice batter you don't need to wipe the batter off completely. Grind for Pesarattu or adai in same ginder. The same day you can have Pesarattu or adai and the next day after fermenting you can have soft spongy idlies. If you grind urad dal separately, you can use it for Urad dal vadai as well. But you need to know the measurement of how much urad dal batter you get for extra half cup you soak. If you take more batter out, the ratio will change and your idlies will not be soft. If you take less, it will not affect the idlies. 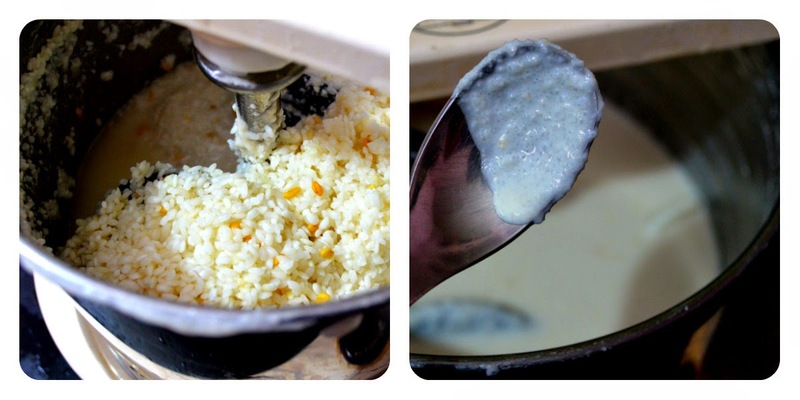 Also for Urad dal vadai, you need to grind the urad dal to thick batter by adding less water. After taking the vadai batter, add water to remaining batter and grind it for 5 mins to get smooth fluffy batter. If you don't have enough experience or you are trying idli batter for first time, please avoid doing this.